After last week's punt on new releases, a beloved franchise returns to the screen... oh, and there's some other sci-fi thing too. We pick up basically where we left off last time, with Rey (Daisy Ridley) under the tutelage of Luke (Mark Hamill, making his first real return to the series after last time's glorified cameo), while elsewhere in the galaxy, members of the new rebellion go after the remaining forces of the First Order (hopefully not another "Blow Up The Big Base" mission). Plot details are tightly held secrets, but there are hints at larger scale battles as well as multiple examples of the one-on-one character building confrontations that Star Wars likes to set up, leading to a set up of the final entry in this new trilogy where they'll finally finish off this Dark Side business for good, right? It's a bit of an open question now how this “main series every other year/side stories the other” plan will work and whether it will remove some of the specialness or cause fatigue. It's not a small part of the argument of why episode VII opened so strongly that it was fulfilling a need of something scarce. What happens when Star Wars becomes commonplace? Then again, we're talking about the studio that can throw out three or four super hero movies a year with no ill effect, so maybe we should all just shut up. Hype is a difficult thing to track, especially when we're dealing with redlined franchises like this. Without having a quantifiable thing to put our fingers on, it certainly feels like there's a palpable decrease in excitement for this edition, if only slightly so. 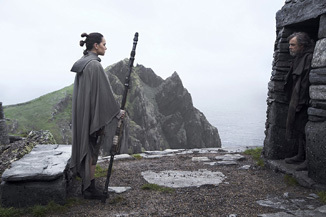 There was a pressure that was relieved by the release of The Force Awakens, and while there's still going to be a mad rush to the theaters this weekend, I just don't foresee another leap in opening weekends – the new plateau has been reached, and it seems like we'll need something else to make that next leap. Additionally, this is a middle entry in the franchise, and you usually see an increase in interest for the end of something, not the middle. There are of course, plenty of examples of franchises that grew throughout, but they were usually ones that started small or had to build awareness. There are Amazon tribes that know about Star Wars. Reviews are fairly ecstatic – though there was little danger of this not being true. Remember that The Phantom Menace received almost universally fresh reviews, which now... yeah... sure. It's a series with a difficult relationship with honest criticism, or at least, for critics to view this through non-fanboy lenses. That said, The Force Awakens was clearly better than all of the prequels put together, so it's not hard to imagine it's on that level, particularly with the switch to Rian Johnson (Looper, Brick) behind the camera and responsible for the script. We got our first look at what a post-Star Wars renaissance looks like last Christmas, with Rogue One, the first of the spin-off stand alone movies, which opened very strongly for any other movie, but was almost a $100 million off the main franchise. We'll see if this is part of a pattern or just a new reality in three days or so. Personally, I think there's going to be a clear split in the greater fandom between main sequence and stand alone, and this should be a slight step back from The Force Awakens' open, of around $220 million. Since Disney isn't about to counter program against its own movie, it falls to Fox... uh... so, listen, about the timing of this... anyway, with the release of Ferdinand the Bull, which I think everyone thought was a Disney property already (so, again, closing a loop). WWE wrestler John Cena voices the title character (wait, you literally can't see him – oh this all makes sense now) as an extremely mild-mannered bull who accidentally causes a rampage and is sent away to a farm and away from his family, including the farmer's daughter who dotes on him. From there it turns into a Chicken Run-esque escape film complete with wacky sidekick animals (voiced most prominently by Kate McKinnon, Anthony Anderson, David Tennant and for some reason Peyton Manning), with a side trip through”Be Yourself Land,” the 3057th iteration of this trope in children's cinema. While not a sterling example of children's entertainment, reviews are solid and this feels like a slow builder that plays well through the holidays for those kids too young for Jumanji. I'd look for about $15 million in its debut. This may eat in a little to the three-week #1 Coco, which held strongly to $18 million last weekend. It'll still be in good position for the holidays, though, with about $11 million this weekend, more than enough to see a significant boost over the 12 or so days of holiday bonanza. At around $140 million right now, it's still on the lower end of Pixar's output in the financial column, but it should get significantly past the $200 million figure once holidays are taken into account. Justice League, meanwhile, is limping towards this period, with just under $10 million last weekend, its fourth. It should grab just $5 million this frame. Wonder, which threatened to pass it last weekend, almost certainly will this one, as the heart-warming drama should nab about $6 million. James Franco's ode to The Room, The Disaster Artist, expands slightly and should stick at $5 million this weekend.